Dyna Solo Saddlebags from The Leatherworks : Made in USA The Dyna Solo Bag is specifically designed to fit HD Dynas. 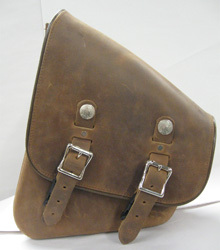 The bag measures 11” tall, 11” long and 4” deep. This one sided bag comes with the mounting hardware (patent pending). To attach the solo bag, you will need to loosen the turn signal and remove the bolt in the front hole by the shock, slide the provided plate into place, line the hole up with the strut hole and replace the bolt and tighten back down the turn signal. Customers will then mount the bag to the plate with the provided nuts and bolts. Hold the bag up to the plate, mark where the holes are, drill and install. There is a piece of steel in the back of the bag, so a good drill will be necessary, 3/8” drill bit. One of the mounting holes is a bit difficult to get to, but the guy who has the prototype did it and he has big hands. It will not work with a detachable backrest or Easy Brackets. 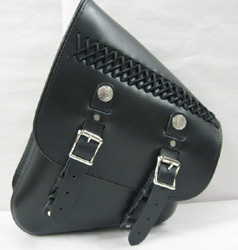 The Solo Bag includes Quick Release buckles under the metal buckles. The Dyna Solo Bag can be customized to fit your needs and desires. The Dyna solo bag is Left side only. It will not fit on the right side due to calipers, the bag sits too close in. Order your Left side bag below. It will fit on 2006+ Dynas without relocating turn signals. We still need to test the 2005 and down Dynas to see if it will fit without relocating turn signals. The 2010+ Wide Glides may not work with the left sided license plate, we still need to test that. It should work on 2005 and down Wide Glides, but we need to test them as well. The Leatherworks expects it to work without any problem, just want to be sure as HD did change the struts in 2006. It will work on 2006-2008 Street Bobs. 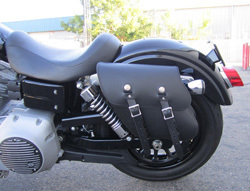 However, the 327 solo bag does NOT work on the 2009+ Street Bobs because the bike does not have strut covers, just the frame where the turn signals or easy brackets attach. 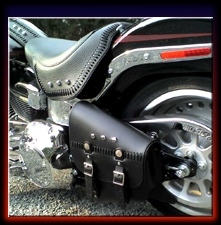 Due to the large flap lid, the Key Locks option does not work on the Solo Dyna Bag. 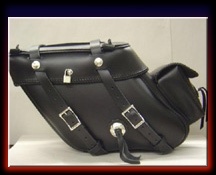 Only the LK option of Installed hardware for Small Pad Lock to lock saddle bags will fit (actual lock not included). 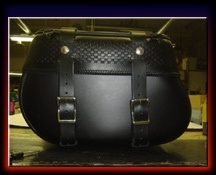 The Leatherworks prides itself on the American Made quality workmanship that is put into every motorcycle Tool Bag. You'll also find great classic styling with a rare attention to detail. The Leatherworks, Inc., founded in 1976, makes handcrafted Solo Bags, Saddlebags and Tool Bags with uncompromising care made from 10-12oz American tanned struck through black leather. This is the heaviest leather being used in the industry. 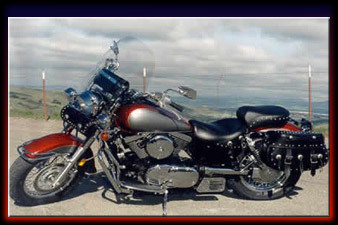 327 Plain Black Leather Dyna Solo Bag for Left Side MEASURES 11” tall, 11” long and 4” deep : comes as a single bag - Make sure to note the Make, Model & year bike on the order form Will NOT work with a detachable backrest or Easy Brackets. (order extras, such as spots and conchos in step two). Includes mounting hardware (see above instructions). It will fit on 2006+ Dynas without relocating turn signals. We still need to test the 2005 and down Dynas to see if it will fit without relocating turn signals. The 2010+ Wide Glides may not work with the left sided license plate, we still need to test that. It should work on 2005 and down Wide Glides, but we need to test them as well. The Leatherworks expects it to work without any problem, just want to be sure as HD did change the struts in 2006. It will work on 2006-2008 Street Bobs. 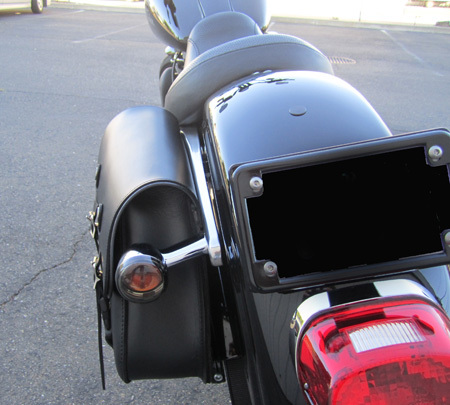 However, the 327 solo bag does NOT work on the 2009+ Street Bobs because the bike does not have strut covers, just the frame where the turn signals or easy brackets attach. Distressed Brown Leather Distressed Brown Leather used to make the 327 Dyna Solo Bag (You must order the $199.95 solo bag itself separately - Click on photo for larger Picture). The distressed brown leather has black streaks and minor flaws. The weight of the leather is about 8 ounces. It is a softer lighter weight leather than the other color bags, but haven’t had any complaints but it is softer. Distressed Black Leather Option Distressed Black Leather used to make the 327 Dyna Solo Bag (You MUST order the $199.95 solo bag itself separately). The distressed Black leather has black streaks and minor flaws. The weight of the leather is about 8 ounces. It is a softer lighter weight leather than the other color bags, but haven’t had any complaints but it is softer. 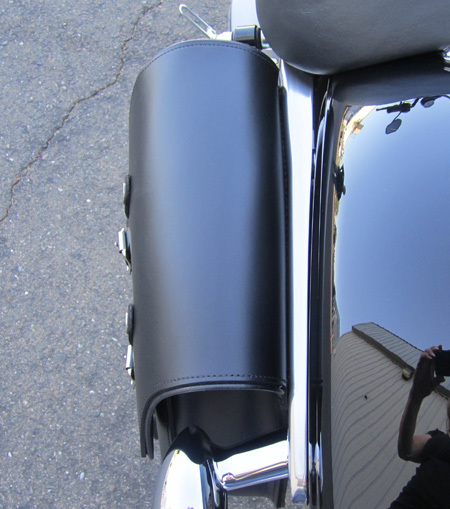 Dyna Solo Bags for Dyna Wide Glides, Super Glides, Wide Glides, Street Bobs and Fat Bobs.